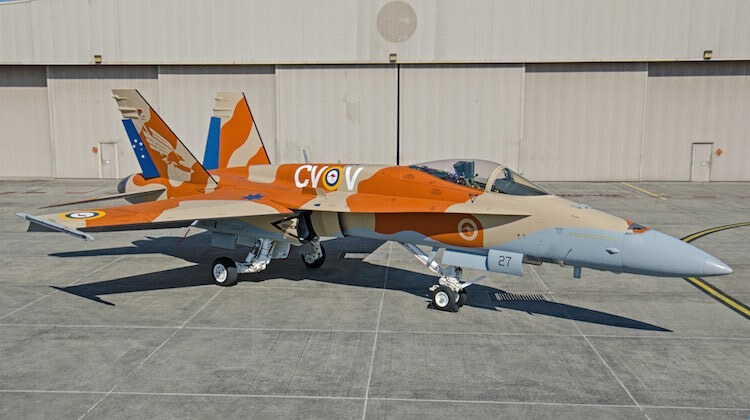 A Royal Australian Air Force F/A-18A Hornet has been painted in 3 Squadron World War 2 desert camouflage colours to celebrate the unit’s centenary. 3 Squadron is one of four RAAF units celebrating their centenary this year, along with 1, 2 and 4 Squadrons, all of which were formed in 1916 during World War 1 as part of the then Australian Flying Corps. This exclusive image by photographer Jaryd Stock shows Hornet A21-27 wearing a hybrid scheme featuring the tan and brown camouflage and the ‘CV-V’ squadron code as worn by P-40 Kittyhawks flown by Squadron Leader Bobby Gibbes – the unit’s longest serving commanding officer during WW2 – plus the blue painted rudders featuring the southern cross that was a feature of 3 Squadron’s wartime P-51 Mustangs. The jet also features the contemporary 3 Squadron bomb-carrying eagle emblem on the tail, WW2-style roundels but featuring the red kangaroo (as introduced in 1956) rather than the red inner circle, and contemporary low vis roundels. …While in June, two 1 Squadron Boeing F/A-18F Super Hornets flew in formation with a replica Bristol F2B Fighter to mark the centenary of the unit’s first operational sorties on June 12 1916. Nice, anything to show for 4SQN and their PC-9/A FAC aircraft? 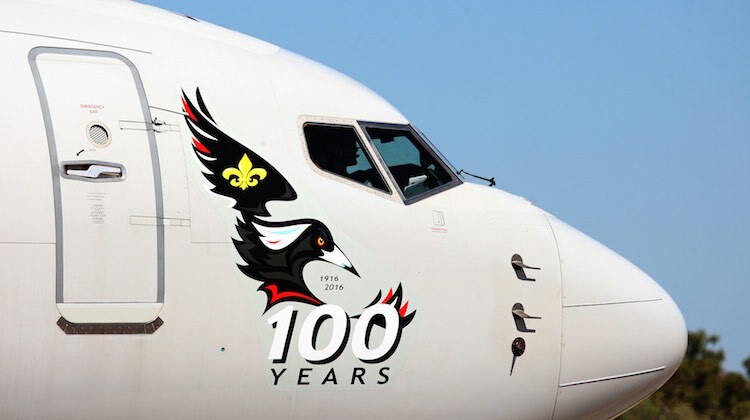 About time that nose art and the like returned to military aircraft. Modern aircraft, both military and civil look so boring now. color scheme wise. Good artwork and mission symbols seem so lacking nowdays..
How about petrol pump symbols on our tanker aircraft when participating on strike missions. Nose art gives a lift to those aircraft and the crews that fly them. . I have waited years for the RAAF to do a WW2 scheme (like the RAF and RCAF often do) and this one is simply stunning with a truly Aussie touch to it. What a great way to commemorate! Ive seen concept art of f-35s in RAAF ww1,ww2 boomerang and cac sabre paint schemes. it would be good to see the F/A-18F in the Bristol’s paint scheme and an amberly F-35 in F-111 camo paint scheme. Would be a great demo jet for Avalon. Something different, yes, but why the Orange Rust & Tan fictitious colours? A proper WWII desert camo would have looked much better imo. Time for 1SQN to come up with something special on a Rhino please! I remember the days when the Air Force put on air shows; back before budget cuts and the eternal war on people without Air Forces on the other side of the world. An occasion like this would have been greeted with many airshows. It would be nice to see that happen again; some return for our taxes. How about it, RAAF PR? As for ” eternal war” that the RAAF’s been involved in, Well, firstly the RAAF doesn’t decide it’s targets, the Federal Government thru various intelligence agencies decide that. I reckon ISIS in Syria & Iraq are extremely justified targets. Ask some locals ! 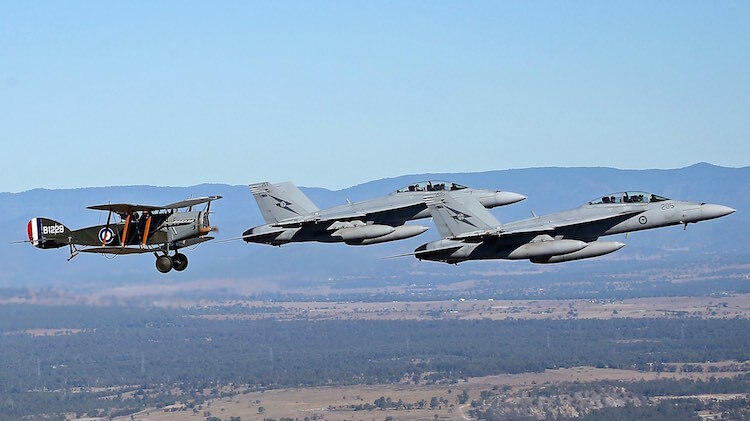 It’s the first time the RAAF have dropped live ordinance on real enemies since Vietnam…hardly ” eternal”. The RAAF is a lot more than fast jets, and the job crews of C-130s , C-17s and B350s do doesn’t get much fanfare, but plenty of local communities are very regularly rewarded by their presence. Hi Chris, I also remember those days when airshows were almost a yearly occurrence. The days before bean counters started to run departments and everyone was afraid of their own shadow. Seriously Australia needs to stand back take a deep breath and take a good hard look at themselves. Is this another case of idiots standing on street corners shouting without really having a clue about what makes them angry? Recently I was browsing through the Defence Image Library for photos of AP-3C Orions. As the aircraft is about to become historic, it struck me that there are thousands of images of grey aeroplanes and nobody knows which aircraft they are. Unless the image is a close-up of the NLG doors or the rear door, it could be any aeroplane. No doubt this is exactly what was intended when it was decided that the aircraft needed to be deidentified but I get the feeling that chickens are coming home to roost and most images will be useless for historical purposes. Dare we hope that in the twilight of their years the Orions are about to get a bit of colour? The Orion has served Australia well. Let her go out with identity and dignity. The Orange colour used in this scheme represents the ‘flame’ of the 3 Squadron crest. Orange has been a traditional trim colour for the Squadron (on and off, depending on visibility constraints) going back to the Sabre Days in the 1950s. The blue rudder with Southern Cross was first used for the whole Squadron in 1944 in Italy on Mustangs, under Squadron Leader Murray Nash (but Murray gave credit for the idea to groundcrew member “Grizz” Bear). The “Desert Sand” camo colour harks back to the Squadron’s long combat stint in the Middle East and North Africa from 1940 to 1943 and “CV-V” reflects the Squadron’s “CV” code and the Squadron Leader’s aircraft code of that time – used most famously on the Kittyhawks of Bobby Gibbes and Brian Eaton. (Even the Messerschmitt 109G captured by the Squadron in 1942 and now preserved in the IWM was temporarily marked “CV-V” when it was flown out of the battle zone by Bob Gibbes.) The “Desert” scheme is also a fitting tribute to the RAAF’s recent deployment in the Middle East on Op. OKRA. Fair enough.Well done RAAF.Any chance 3SQN will bring this to Avalon?